AVENGER's first two albums, "Blood Sports" (from 1984), and "Killer Elite" (from 1985), were recently reissued on CD via Dissonance Productions, and on LP via Back On Black Records. The reissues are packed with previously unreleased and rare bonus tracks, and booklets with previously unseen photos. 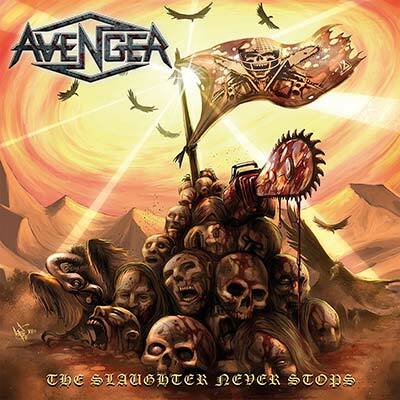 The series is now continued: AVENGER's comeback album, "The Slaughter Never Stops" (originally released in 2014, and available as limited edition CD only), will be available on for the first time ever on LP, with a brand new cover artwork painted by Roberto Toderico (TYGERS OF PAN TANG, QUARTZ, MYTHRA). • AVENGER's comeback album, "The Slaughter Never Stops" (originally released in 2014, and available as limited edition CD only). • Available on for the first time ever on vinyl! • Metal, classic metal, thrash metal... NWOBHM! These are the defining genres that best describe AVENGER. • Packed with previously unreleased and rare bonus tracks, and booklets with previously unseen photos. • With brand new cover artwork painted by Roberto Toderico (TYGERS OF PAN TANG, QUARTZ, MYTHRA). • For fans of Satan, Jaguar, Judas Priest and Blitzkrieg.